I forget sometimes what outdated attitudes still linger outside of this nice little gay-friendly bubble in which I spend most of my life. 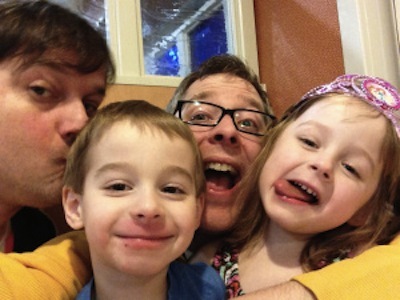 Last month, I recorded a podcast called Dadsaster. The topic was Gay Dads, and I was the gay dad they interviewed. I was a little surprised to discover that after interviewing me, the hosts were set to question a member of the anti-gay Family Research Council, as if “Gay Dads” was a topic that required a pro-and-con debate. So now, with some distance from the discussion, I’d like to offer another, more decisive answer to the question of whether my kids are more likely to turn out gay. Let’s say, despite all common sense, that gay parents were more likely to raise gay kids. So does that mean we shouldn’t be allowed to have families? Because the world would have—gasp—more gay people as a result? Nevermind that these would be happy, well-adjusted gay people raised by loving families. Just the fact that they were gay would suggest to some people that they weren’t parented properly. Before our kids were born, Drew and I speculated a lot about what they would be like. One day, Drew surprised me by saying he hoped they wouldn’t be gay. He was worried life would be harder for them—the same thing many straight parents say when speculating about their kids—and that if we raised a gay kid, it’d somehow lend credence to people’s fears about LGBTQ parents.